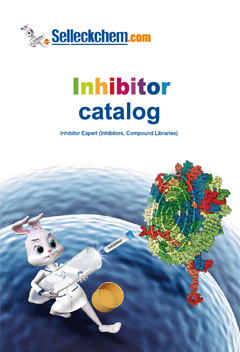 Dorsomorphin 2HCl is a potent, reversible, selective AMPK inhibitor with Ki of 109 nM in cell-free assays, exhibiting no significant inhibition of several structurally related kinases including ZAPK, SYK, PKCθ, PKA, and JAK3. Also inhibits type Ⅰ BMP receptor activity. AMPK inhibition by compound C(Dorsomorphin) inhibited autophagy activation and neuroprotection induced by IPC in PC12 cells. (A) Compound C (Comp C) abolished IPC induced neuroprotection in PC12 cells. Cells were incubated with compound C 5 μM 60 min before the onset of IPC. Twelve hours after IPC, the cells were subjected to OGD for 10 h and cell viability was examined with CCK-8 kit. (B) Compound C reduced LC3II/LC3I ratio. The cells were incubated with compound C 5 μM 60 min before the onset of IPC. Then the cells were harvested 12 h after IPC and subjected to Western blot analysis. Bar represents mean ± SD, n = 3. *P < 0.05, ***P < 0.001 compared with the control group; $$$ P < 0.001 compared with the OGD group; %%% P < 0.001 compared with the IPC + OGD group; # P < 0.05 compared with the IPC group. Mol Brain, 2015 ,8:20.. Dorsomorphin (Compound C) 2HCl purchased from Selleck. MEFs were cultured under hypoxia, and the activity of endogenous AMPK was inhibited with Dorsomorphin 2HCl (1 μM). Cells were fixed in 4% paraformaldehyde and stained with anti-TIM23(mouse) and anti-ULK1 (rabbit) primary antibodies then Alexa Fluor 488-labeled donkey anti-rabbit IgG and Alexa Fluor 555-labeled donkey anti-mouse IgG secondary antibodies before analysis by immunofluorescence microscopy. Arrows indicate ULK1 puncta that colocalize with mitochondria. Bar, 10 μm. FEBS Lett, 2015, 589(15):1847-54.. Dorsomorphin (Compound C) 2HCl purchased from Selleck. MEFs were cultured under hypoxia for 6 h and treated with Dorsomorphin 2HCl (1 μM) to inhibit AMPK, si-AMPK to knock down endogenous AMPK, or Metformin (2 mM) to activate AMPK. The cells were fixed in 4% paraformaldehyde and stained with anti-TIM23 (mouse) and anti-LC3 (rabbit) primary antibodies then Alexa Fluor 488-labeled donkey anti-mouse IgG and Alexa Fluor 555-labeled donkey anti-rabbit IgG secondary antibodies before analysis by immunofluorescence microscopy. Bar, 10 μm. FEBS Letters, 2015, 1847-1854.. Dorsomorphin (Compound C) 2HCl purchased from Selleck. The expression levels of pSmad1/5 were analyzed after 12 h of RA treatment, 2 h of dorsomorphin (Dorso, inhibitor of BMP signaling pathway) treatment, or both. Similar results were obtained in two separate experiments. BMC Biotechnol, 2017, 17(1):17. Dorsomorphin (Compound C) 2HCl purchased from Selleck. Zhou G, et al. J Clin Invest. 2001, 108(8), 1167-1174. Meley D, et al. J Biol Chem. 2006, 281(46), 34870-34879. Yu PB, et al. Nat Chem Biol. 2008, 4(1), 33-41. Kim YM, et al. Atherosclerosis. 2011, 219(1), 57-64. Is there any information you may provide as to WHICH AMPK SUBUNIT is this drug targeting in the AMPK complex? HTH-01-015 is a potent and selective NUAK1 inhibitor with IC50 of 100 nM, >100-fold selectivity over NUAK2. AICAR (Acadesine), an AMPK activator, results in accumulation of ZMP, which mimics the stimulating effect of AMP on AMPK and AMPK kinase. Phase 3. Features:A potential first-in-class adenosine regulating agent (ARA). Phenformin HCl is a hydrochloride salt of phenformin that is an anti-diabetic drug from the biguanide class. 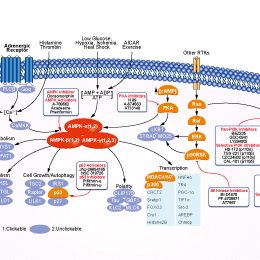 It activates AMPK, increasing activity and phosphorylation. WZ4003 is a highly specific NUAK kinase inhibitor with IC50 of 20 nM and 100 nM for NUAK1 and NUAK2 in cell-base assays, respectively, without significant inhibition on 139 other kinases.